Mindfulness & Running | Run Inspired. Mindfulness, the trait of staying aware of (paying close attention to) your responsibilities. When I run, I am not as mindful as I should be. Sometimes I try to force something instead of letting it happen. When I stop trying to force it and let it happen naturally, it’s so much more enjoyable. Many times when I tell people I love running, their first response is I hate running, it’s so boring. I believe it’s the complete opposite… when I am being mindful. When I am being mindful, running is effortless. My feet are swift and my body is light. I am not fighting myself. I am letting what is, be. Running means so much more when I am being mindful. Tomorrow, I will aim to be more aware of my responsibilities. Running Update: Today I could feel myself carrying a little too much tension as I ran. I found my shoulders creeping up a little more and my form wasn’t what it should have been. 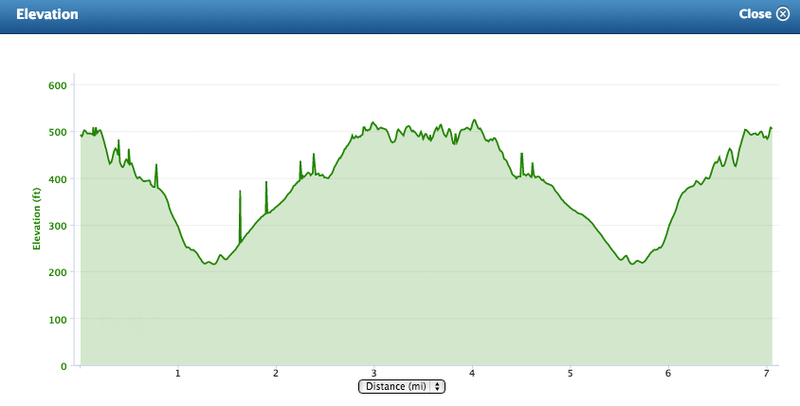 I ran out at Umstead and got quite the hill workout. Stats are here and just check out this elevation chart.